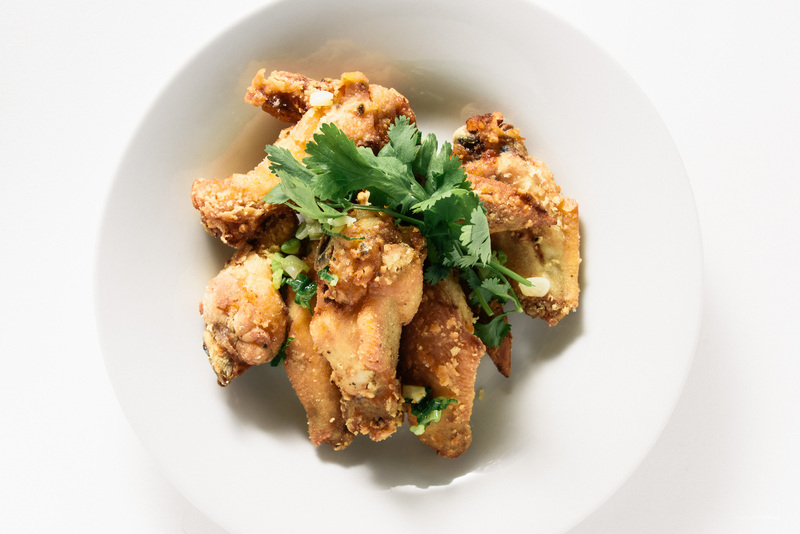 There’s a restaurant in Vancouver that’s known for its fried chicken wings. It’s a hole in the wall kinda joint in Chinatown, where you have to line up for hours, usually in the rain, for your hit of chicken wing crack. When I’m in Vancouver, you’ll find me there most rainy nights. I’m not quick sure what makes their wings so addictive, but I’m pretty sure it’s a mix of MSG and sugar. I skipped out on the powdered MSG, only because I don’t have any on hand – I don’t have anything against it at all, in fact, I have fond memories of my mom using it when we were little, before MSG got a bad rep. Instead of MSG, to amp up the umami flavor, I turned to one of my other favorite flavors, fish sauce. 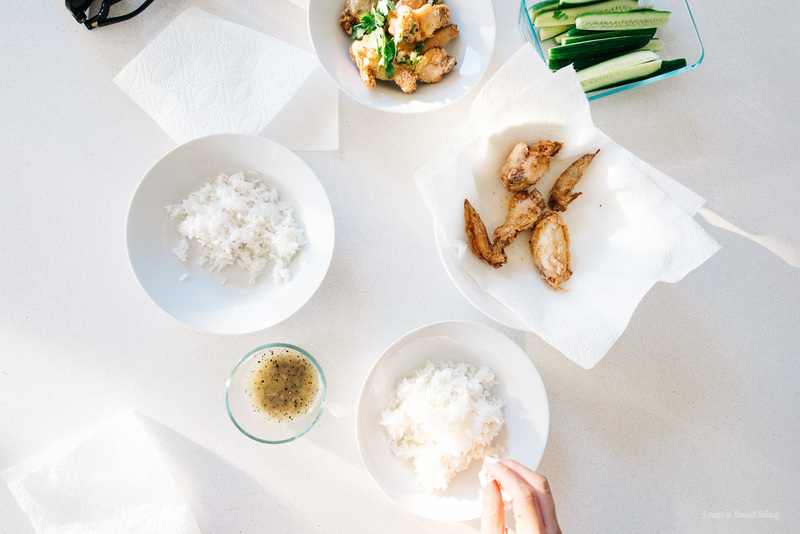 A quick fish sauce and sugar marinade, rice flour for a light and crispy coating, and lime with salt and pepper for dips and you’ve got fried chicken wings that I could eat all day, every day. Seriously guys, this fried chicken is magic. It manages to be light (for fried chicken) and the sugar just adds that extra bit of interest. I know what you’re thinking, sugar on chicken?! But trust me, you want this chicken. I want this chicken! 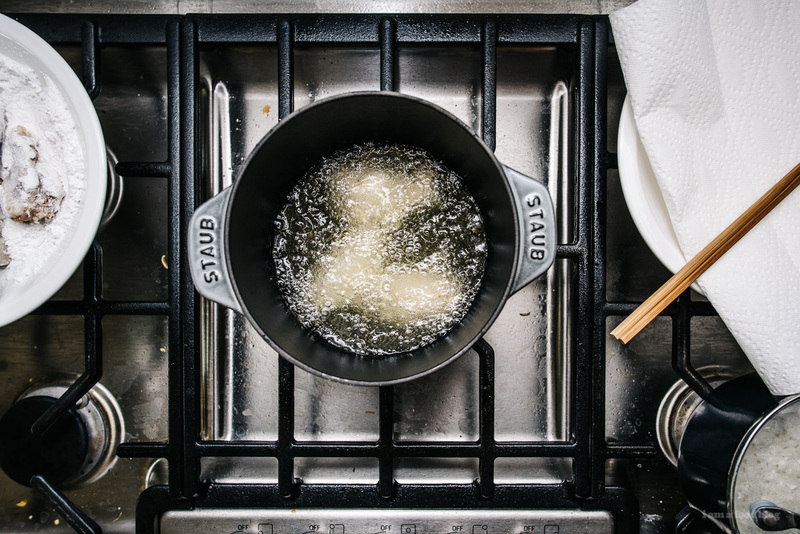 In a large bowl, whisk together the fish sauce, garlic, sugar, and lime juice. Add the wings and toss to coat. Let marinate for 1 hour. 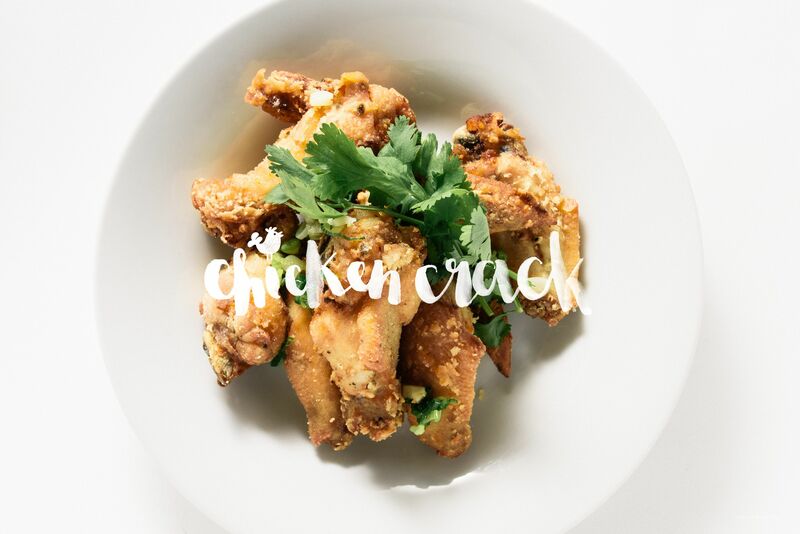 Place the rice flour in a bowl and, working in batches, coat the chicken wings, shaking off the excess flour. Use a pair of tongs to gently add the chicken to the hot oil. Deep fry in batches, being careful not to crowd the pan. Flip occasionally as needed, until crunchy, brown and cooked through, 7-8 minutes. Let drain on a rack or paper towels. Sprinkle generously with sugar while still hot. Top with cilantro and green onions. In a small bowl, whisk together the lime juice and salt and pepper. You want enough pepper that the lime juice looks almost grey. 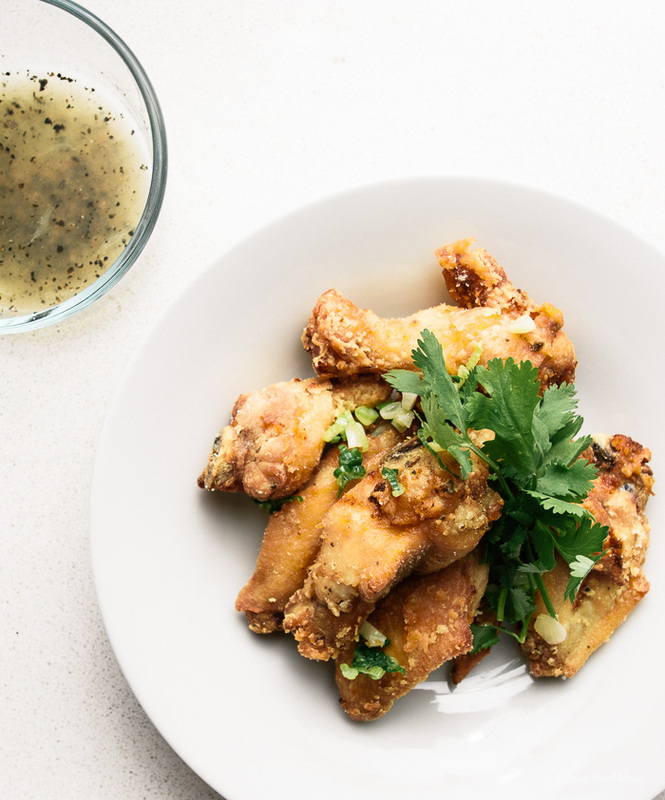 Dip wings into the lime-salt-pepper sauce and enjoy! this actually made me drool. Fried chicken is my death row meal and Phnom Penh is one of my fave places I’ve been! Def making this. ooohhh. i was just in texas and i couldn’t help but prefer asian chicken wings i’ve had in the past over the fried chicken i tried in texas. and if you haven’t tried the dry fried chicken wings from san tung in sf, gogogogo!! Going to try make these these next week for my taste of Asia fest for my friends, cheers Stephanie! This sounds fantastic! I’m going to have to try this. Great recipe, I made them four times already! Thanks. Thank you thank you thank you for posting this recipe! My favorite chicken wings on earth! I was lucky to have them when I was in Vancouver and I’m glad I can make them at home. You’re the best!!! haha we’re in Phnom Penh, Cambodia and I wish we could get wings like this! GIRRRRL I haven’t had phnom penh chicken wings in so long…I CANT EVEN. Oh gosh, my mouth is watering! Book marked for later. Too hot to cook this right now, but in fall I’m all over it! Good lord, this looks amazing. Can you substitute the rice flour for white flour? yes, but it might not have the same amount of crunch. Oh man! We love Phnom Penh wings! Every time we visit Vancouver it’s on the top of our food list. Haven’t been back since 2015 and no signs of being sale to go back this year so really excited you posted this! Definitely cooking this for dinner tomorrow night! THANK YOU! how much msg would be used if fish sauce isn’t being used? 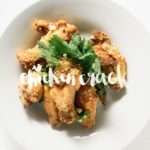 hi amanda, i haven’t made these wings without fish sauce, it’s essential to the dish! 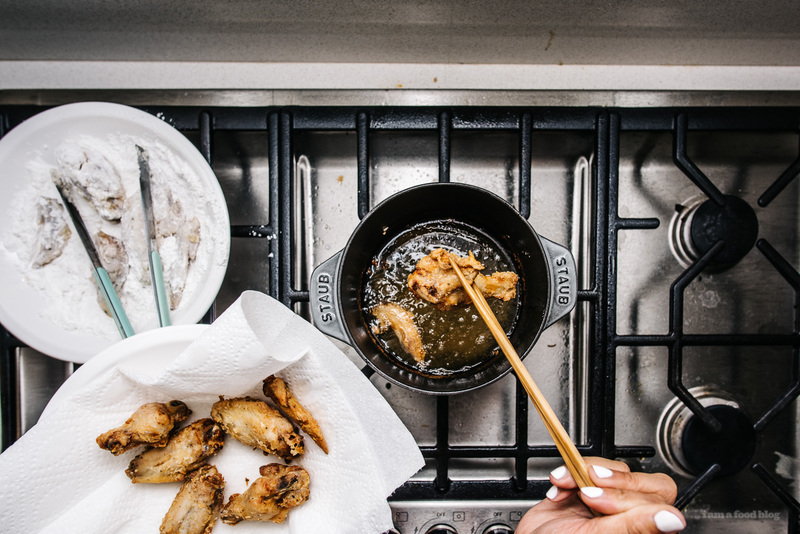 To get it closer to the PP’s wings, toss the fried wings in some quick sauteed garlic and sliced green onions and sprinkle a mixture 5 spice pepper mixed with salt and a smidge of sugar.